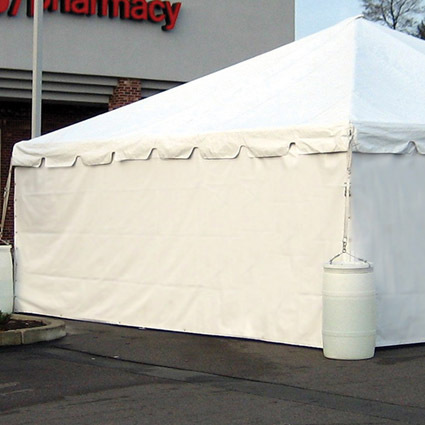 Our sidewalls can transform any tent cover to a self-contained structure. Manufactured from 13 oz. flame retardant top quality vinyl, our sidewalls are available in a number of styles including solid, clear, mesh, and cathedral window. They are designed to attach and be removed easily with quick release vinyl fasteners that are sewn every 24 inches along the top of the sidewall. The Standard style sidewalls feature a 2” Velcro® overlap on both ends that allows for a seamless connection between walls and prevents flapping. Grommets are also evenly spaced every 5 ft. along bottom of sidewall.